BGO Ecoshop – A blog on organic food and everything else about living in harmony with nature. Chinese New Year is just round the corner and as many knows, this is a period of time where there is an abundance of food and especially unhealthy food, that is, food high in sugar and oil. On the eve of Chinese New Year, reunion dinner is the highlight and many tend to go overboard with table-full of seafood, meat and other delicacies. Coupled with late night merry-making and early morning rising for the visiting, no wonder many fall sick after Chinese New Year! Drink mineral or plain water and take more fruits instead of sugared drinks. Taking fruits directly is also better than taking fruit juices so that more fibre can be consumed. Niángāo (sticky rice cake) is typically made of rice or glutinous rice flour. You can add red beans or dates to the niángāo and steam it to make a yummy and healthier snack. In TCM (traditional Chinese medicine), grains that is the main ingredient in making niangao invigorates the function of the spleen and stomach. Red dates and beans are good for the qì and blood. Another Chinese New Year must-have delicacy is jiǎozi or dumplings. 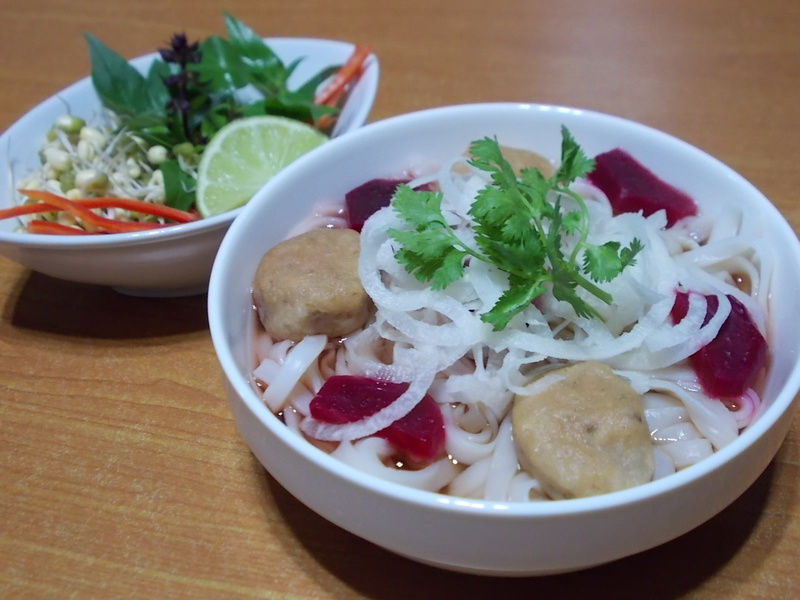 Similarly, jiǎozi is considered a healthy food because in each small dumpling, you can include grains (jiǎozi skin), meat (filling, typically pork), legumes (peanuts, dates, chestnuts, tofu) and vegetables (carrots, cabbages, spring onion). Cooked in soup or steamed, these are very delicious and filling food. By cooking vegetables whole instead of chopping them up, you will need to chew on them longer and the enzymes in saliva aid in better digestion. Fibres in vegetables also encourage intestinal activities, preventing constipation. Also, more meat and glutinous rice is consumed during festive period and these are considered wēn (warm) nature in TCM. Taking too much of these will cause the internal organs to be “warmed” and cause absorb and retain more fats. On the other hand, mustard is consider hán (cold) in nature and will dissipate the heat in the internal organs. Keep active during festive season to not just work off the extra calories consumed but also to avoid constipation. Have a good breakfast packed with vegetables, grains and legumes to start off your days of celebration. This will be a good balance to the loads of meat and oil consumed later on. Go easy on the hot pot. People suffering from constipation, piles and indigestion should go avoid food that are too hot, spicy or sour. If you are diabetic, it is best to take small frequent meals to avoid taxing your intestines and stomach. People suffering from peptic ulcers should avoid, alcohol, sugars, high fats, coffee and spicy and sour food as these will stimulate secretion of gastric juice. People suffering from back flow of gastric juice should also avoid these food, as well as food that are too hot, too cold or too oily, and chocolate, onion and garlic to prevent heartburn and acid back flow. People with gallstones should also avoid high fats food to prevent pains in the stomach. During this merry Spring Festival, eat healthy, eat in moderation and keep active. May all readers have a happy Chinese New Year and receive a prosperous year ahead! Years ago, I read and highly recommended Japanese tidying guru Marie Kondo’s book titled The life-changing magic of tidying up – the Japanese art of decluttering and organising. After finishing reading the book, my husband and I were inspired by Marie’s tidying philosophy and were both eager to tidy up our wardrobe and books. It was a much smaller scale of organising compared to whole house decluttering, but still it took us a good half a day at least to get through it. The result left us both extremely satisfied. Marie is right, the process itself is cleansing. I had never felt so good about myself and had a clearer picture of the things that I would like to have in my life, that is, “spark joy” in me and have a more sensible approach to getting new things. Many years later, after 2 children and 3 maids, our house got messy again and we decided to reorganise our storeroom. This time, it took us one whole day to pull everything out, sort, clean, label and put everything back in logical order. In the end, we were exhausted but seeing the neat and tidy storeroom where everything is in first access order, it left us immensely happy. So you can imagine my delight when I see the series Tidying up with Kondo Marie showing on Netflix. I was excited and curious at the same time, to see how the petite, Japanese-speaking Marie tackle American household mess. After watching a few episodes, I am happy to see that the important principals of the KonMari Method was portrayed well in the reality TV show. The KonMari method is simple actually, but it can be trying for some people to carry through. Ultimately, as Marie puts it in her book, first of all, we have got to want to tidy up. This process has got to start from us, having a desire to get more organised in our life. By starting with a strong motivation and with an end in mind, there is bound to be a successful end. Of course, if you are over zealous, your house might end up like this. But hopefully, it is more like this. The motivation for tidying up and reorganising got to come within ourselves. Start by visioning what result you want to achieve. Does it spark joy? This one simple maxim in deciding which item to keep and which item to discard can be difficult to grasp and follow through. I learnt that it is easier to start by holding the item that you obviously love the most and hold on to that feeling. That is your “joy”. Doing this exercise regularly as you sort through your items one by one will accustom yourself to be more aware of your own emotions, likes and dislikes. The sorting and elimination will then become easier and easier. Folding makes the clothes more compact and easily stored. Also, the KonMari folding method props the folded clothes up neatly and easy to see and retrieve. After watching Marie Kondo on Netflix, a lot of viewers are probably going to buy a lot of boxes. The small guru always arm herself and her interpreter with boxes of all sizes to help her clients store their items properly. The boxes help give the items a “home” so we know exactly where to place them back after use. Using boxes just makes so much sense. Do not despair if, after days of tidying, you find your room not any much neater. In fact, the mess seems to have worsen. This is what is to be expected – the disorder and puke before a yoga cleansing. Marie Kondo applies the Japanese shintoism belief that things in nature are sacred and spiritual and this translates into mindfulness and gratitude in tidying up. So we are mindful of our “joy” and thankful to the things which have served us before but we need to discard them now. Marie Kondo said she does not need to tidy her room again after the initial tidying up because her room is already tidy. In other words, after you spent a weekend, weeks or even months tidying up, you should only spend minimal time in maintenance. Well, I look around my house and cannot help but see lack of maintenance in lots of spaces. Looks like it’s time to KonMari my house again! If you are gearing up to KonMari your room too, after watching the TV series on Netflix, I urge you to read Marie Kondo’s books first as they expound her declutter philosophy and method in detail. Vinitha contacted me and told me she has a cookbook published. First thought that came to my mind was, finally! I attended Vinitha’s culinary lesson before and it left an impression in me. 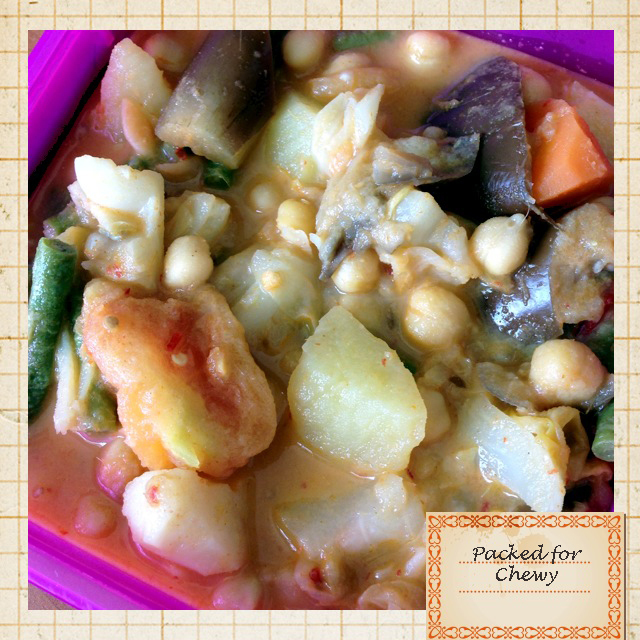 Vinitha is thorough in her explanation and her meals are tasty and healthy. Vinitha was a nurse before and she understood the importance of health and how to upkeep our body. Part 1 educates readers on the toxins in our foods and the right mindset in a healthy diet. Part 2 consists of 12 NutriMeal breakfast recipes. Part 3 introduces whole food plant-based diet and answers some questions on important elements in the diet. The cookbook is ring-bound and props up nicely on its own. The recipes are translated into Chinese and followed with pictures that are well-explained. It is a wonderful gift for everyone keen in improving their health through diet. This cookbook is retailed at $19.80 and is available at BGO Ecoshop now. Enter promo code NUTRIMEAL20 to enjoy 20% discount. Time flies (yet again!). Things have gotten crazy at BGO Ecoshop and in some ways, good. I have been trying to grow BGO and started listing items on Redmart marketplace in Aug 2018. Since Redmart’s entry into Singapore, this online grocery company has disrupted local grocery shopping scene. Consumers can shop for a wide variety of groceries online and have them shipped to their homes at a really low shipping rate. Since Redmart, there have been quite a few online marketplaces in a small Singapore market. I was glad that BGO Ecoshop was invited to join Redmart at its start and it has really helped BGO gained a lot more customers. There are orders to be fulfilled every day and this has kept us busy (happily). The downside of it is orders from our own website has been dwindling and this caused me to focus more on developing our marketplace site and products on Redmart and neglected BGO’s own website. And this is truly unacceptable. WELL, the new year has begun and I want to make a change. Products should be updated more regularly and blog posts should be kept up too. Upon reflection, I have built meaningful relationships with BGO customers over the years, though many I have never met. Such relationships established through blogging takes many years to build up and I certainly would not want to waste previous efforts. I am excited to blog about ideas to make Singapore greener, and how we can make ourselves stronger and healthier. I am eager to introduce new BGO products to you. Personally, I have many projects in mind to be done. I wish 2019 be an even more fruitful year for BGO Ecoshop and also an exciting and joyful year for all of you who read this. To all BGO supporters all these years, I THANK YOU from the bottom of my heart. 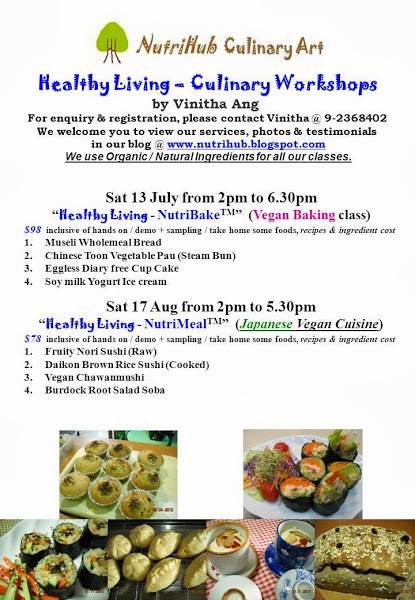 Ms. Vinitha Ang is teaching Thai/Viet vegan cuisine, Singapore Shiok Food (vegan style), Hakka/Malaysian vegan culinary classes starting from 21 March 2015. What a spread! 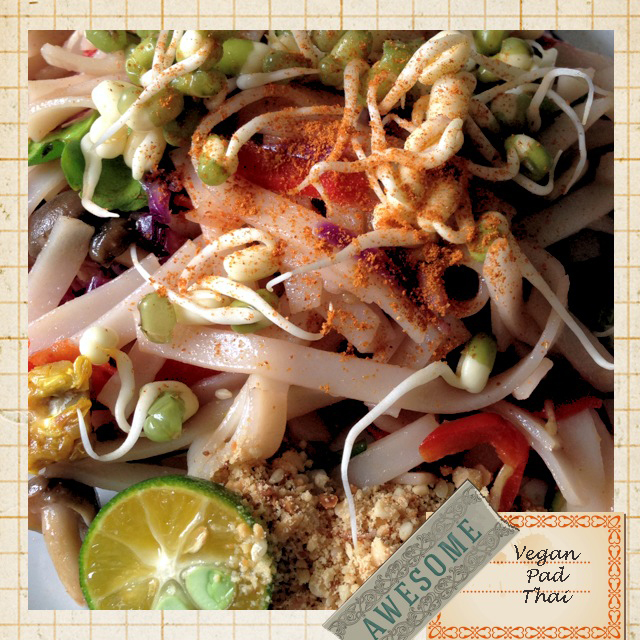 Please check out her blog at http://nutrihub.blogspot.sg for more details. 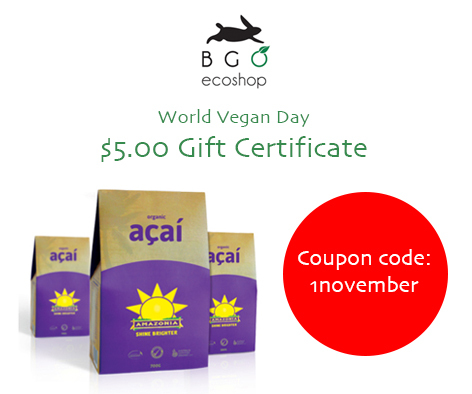 We want to celebrate World Vegan Day (1 November) with you by giving our loving customers $5.00 gift certificate! You can redeem this one-time discount code when you shop at BGO Ecoshop from now till 2 November 2014. This is on top of our items on Specials and Quick Sale! Idocare Cleaning Products – Family Size! For orders by email, just quote this coupon code and we’ll apply $5.00 discount to your total. And yes, the Gift Certificate is transferable, so let your friends know! 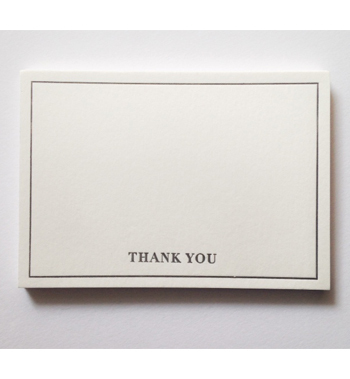 Make that greetings or word of thanks even more special with letterpressed cards. 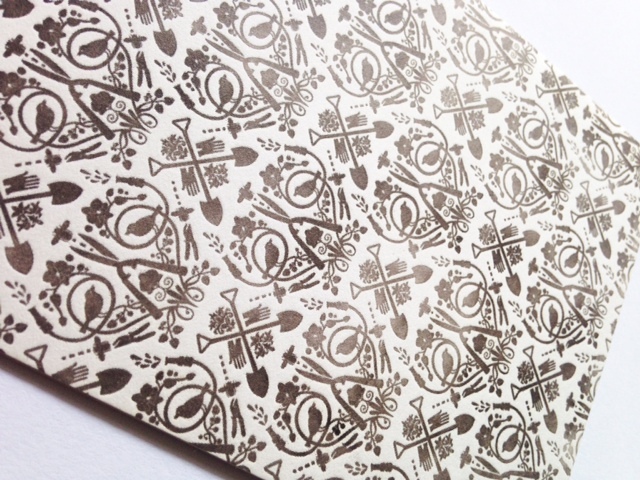 Handpressed locally by The Gentlemen’s Press. Now available at BGO Ecoshop’s Handmade category. Handmade items have their individual uniqueness. No two cards are the same but they speak the same of the maker’s dedication and creativity. As the year comes to an end and the weather starts to get a little chilly (and rainy for this part of the world), one’s immunity can get low. It is important to strengthen our immunity so that we don’t succumb to sickness such as the dreaded flu bug. The Lapacho tea is a natural antibiotic which means we get immunity boost while drinking tea! The Pau d ‘Acro tree grows in many parts of South America and was treasured by the ancinent Guarani healers for its inner bark. This tribe from the rainforest of Paraguay discovered it strengthened the body’s natural defenses when made into a tea. A all-natural tea that can help you reduce inflammation and pain, and boost immunity. The inner bark of the Lapacho tree yields naphthoquinones, anthraquinones and other phytopharmaceuticals that generate remarkable health-promoting benefits. Scientific research has shown these substances to be: anti-inflammatory anti-viral anti-oxidant anti-bacterial anti-fungal anti-yeast parasiticidal. Drinking lapacho tea regularly will diminish the chance of developing arthritis, diabetes, bowel problems, bladder infections and cancer. It will also increase blood and bone marrow health. 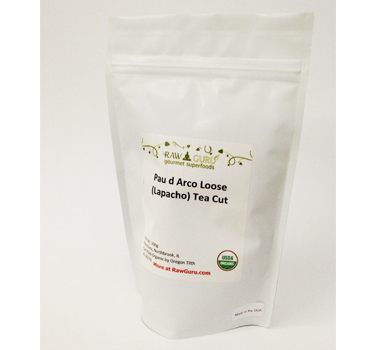 Lapacho tea is now now available at www.bgoecoshop.com. Place a teaspoonful of lapacho in 250ml of cold water. Warm at low heat and cook for 5 minutes, then brew for 15 minutes. Strain and enjoy. Not recommended for people on blood-thinning medication, pregnant and breastfeeding ladies. Tim Ferriss talks about his pine pollen cocktail in this interview and his new book 4 Hour Chef and what it did to a dog. Raw Pine Pollen is an anti-aging superfood that restores optimum hormone balance. Now available at http://www.bgoecoshop.com. Pine Pollen is nature’s most potent food—the ultimate superfood—containing a full spectrum of nutrients with specific anti-aging compounds. Pine Pollen is also the most potent source of phyto-androgen available, nourishing your body like no other food or supplement can, while restoring optimum hormone levels. Eliminate your need for supplements—the health benefits of Pine Pollen are unsurpassed and unparalleled, you will be amazed. • Dissolves and removes age spots on skin and in the body. Only a food containing such potent doses of so many nutrients can so thoroughly improve your health. Only Raw Pine Pollen contains such potent nutrients. Raw Pine Pollen is by far the post potent form of Pine Pollen, and is the product recommended to everyone. In the raw form, all of the vitamins, minerals, and the phyto-nutrients like MSM, SOD, the phyto-androgens (Androstenedione, Testosterone, Dehydroepiandrosterone (DHEA), & Androsterone) and the living enzymes and co-enzymes, stay intact. Because Pine Pollen works synergistically, consuming the pure, raw powder delivers the most profound health benefits and effects. RawGuru’s Raw Wild Pine Pollen is over 99% digestible, ensuring that you absorb and experience all the health benefits of Pine Pollen. In comparison, bee pollen is estimated at 5% digestibility. Be the first 10 customers to answer this simple quiz and win your preferred Green Cleaners’ product (choose one out of a range of 6 cleaners – Bathroom & Shower, Dishwasher, All-Purpose, Toilet Bowl, Window & Glass, Wood Furniture. ‘Simply Her’ magazine (JAN 2011) independent consumer road test rated Green Cleaners as the best amongst 5 selected eco-friendly home cleaning products. True or Flase? 2. Email reply is to reach bgosingapore@gmail.com by 2 Sept 2013 (Mon) 12pm. 3. Indicate in your reply your preferred cleaning option – Bathroom & Shower, Dishwasher, All-Purpose, Toilet Bowl, Window & Glass or Wood Furniture. Note: For verification purpose, winners agree to have their particulars (name and email) disclosed to Green Cleaners, the sponsor for this contest. Hurry and win one of these eco cleaning products! 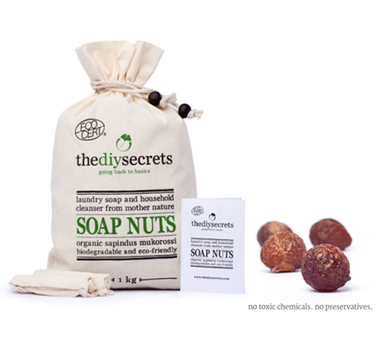 Soap Nuts is a safe and natural laundry soap and versatile household cleanser. BGO Ecoshop (www.BGOecoshop.com) now stocks eco-friendly ECOCERT Certified organic Soap Nuts, available in 250g, 50g and 1kg packs. They are of Sapindus Mukorossi species, free from pesticides and de-seeded. And it comes with 2 cotton wash bags and 1 instruction booklet. 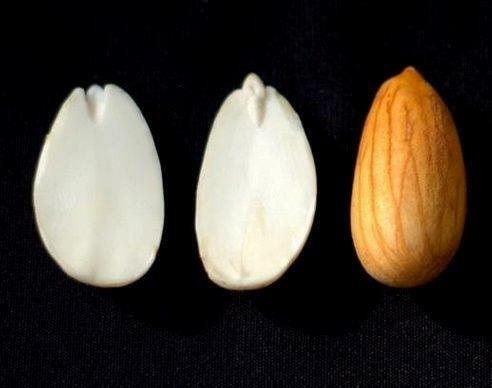 Grown on trees, Soap Nuts is a fruit that contains Saponin, a natural surfactant, in its shell. When the shells come in contact with water, it releases Saponin that removes dirt and grime. Since centuries ago, people around the world have been using Soap Nuts for their laundry, personal body and hair wash and household cleaning. And today, it is an Eco-friendly alternative to synthetic detergent. Soap Nuts is safe for your health and for our environment. It is a gentle choice for people who are allergic to chemical residue on clothes from detergent. It is safe for babies and children. For people with skin condition such as Eczema, Soap Nuts will not aggravate the condition. And for anyone who wants a clean and safe home for their family, Soap Nuts is an excellent option. 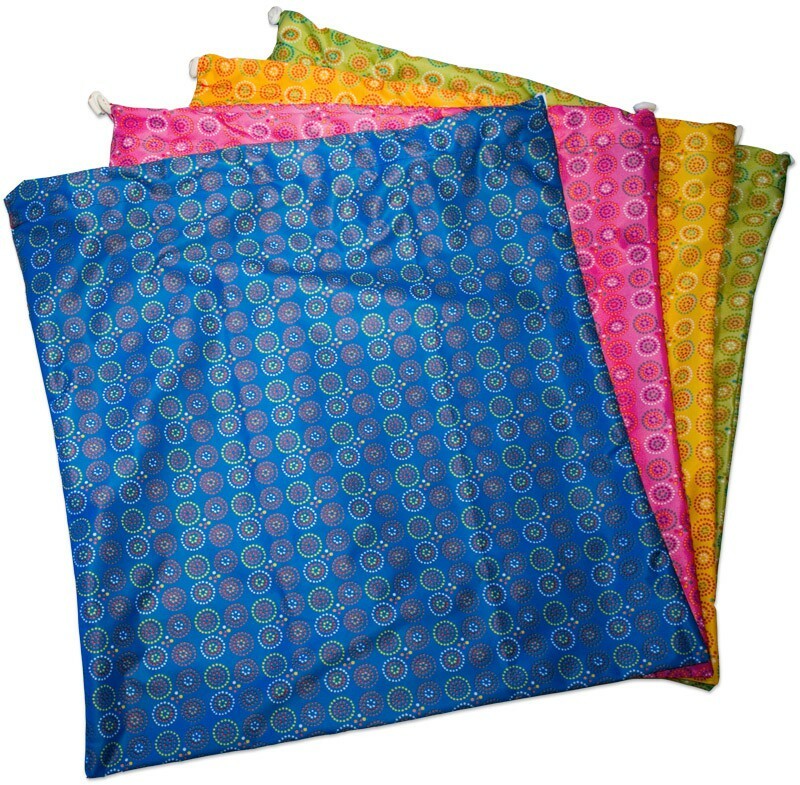 Effective for laundry and suitable for all fabric types. It leaves your laundry clean and soft, and it does not require fabric softener. Low in suds, it is suitable for use with all types of washing machines including High Efficiency (HE) washers. A safe and natural alternative to detergent for anyone. Convenient to carry and use while travelling or camping. Versatile for all household cleaning. Put 6 whole shells (12 halves) into a cotton bag. Soak it in a bowl of hot or warm water for at least 15 minutes. Toss the bowl of liquid and soap nuts into your washing machine together with your clothes and start the wash cycle. Remove soap nuts and let it air-dry. Re-use for your next 1-2 batch of laundry. Top up with new shells if desired. Toss the bowl of liquid and Soap Nuts into your bucket and fill the bucket with water. Add your clothes into the bucket and let it soak for an hour. Scrub and rinse as usual. Add half cup (120ml) of concentrated soap nut liquid into the washer and start your wash cycle. Note: See below for instructions on making your own concentrated soap nut liquid. Add 10 whole shells (20 halves) in 1.5 litres of water. Let it cool and then strain and store the liquid in an air-tight bottle. Use full strength or dilute with water as desired for house cleaning. As soap nut liquid has no preservatives added, use the liquid within a week. Make smaller batch of soap nut liquid if your usage is low. Simply reduce the recipe above in proportion. Soap Nuts are best stored in a dry and cool environment. If heat and moisture gets to them. it will pre-release its saponin and turn a little sticky. However, this does not affect their cleansing ability. Store them in an air-tight container and away from the sunlight and moisture if possible. I‘m so glad your soapnuts comes in 1kg now, can’t get enough of it! I have been using soapnuts for my laundry for more than 2.5 years now. There was no turning back since the day a tiny pack was gifted to me. And now, being a mother myself, i try not to expose my baby to harmful ingredients in products as much as possible. 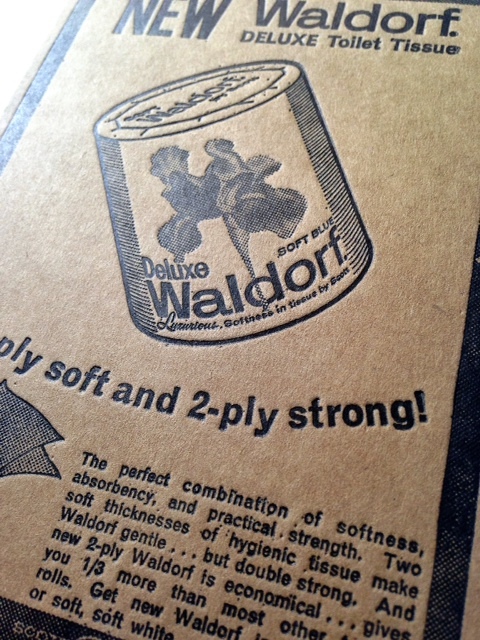 ‘am so glad i can use soapnuts for her laundry – chemical-free. One of the enjoyment of eating durians is to pry open the hard thorny shells yourself, revealing the yellow thick flesh and welcoming the strong scent of this King of Fruits. Even our cat B.B. loves to eat durians. When I was pregnant with my first child, my foetus was diagnosed to have intrauterine growth retardation. meaning she was showing signs of slow growth. This potential disorder naturally worried us as parents. I did a more detailed scan and thankfully there was no fetal genetic disorder diagnosed. Nonetheless, we were at a loss, not knowing how we can help our baby gain weight quickly. Fortunately, my gynae recommended that I start to eat durians. Based on his experience, “Durians give big babies”. I must admit I was a bit skeptical about this initially but was more than willing to try as I like durians. When I was young, my father used to buy big sacks of durians during the durian season (typically June till August) and sat the whole family around to have a durian feast. It was always an enjoyable feast but we never really know the benefits of eating durians. We did know that it is an expensive fruit and you either love it or hate it. Also, if you ate too much of durians, your body will feel “heatiness” and you will experience sore throat and such. That is why we often eat durians together with “cooling” fruits such as mangosteens (which happen to share the same harvest season as durians). So back to my durian quest during my first pregnancy. I took durians about once a week for a few months and to my pleasant surprise and relief, my baby did gain weight. In fact she gained weight so fast near my EDD that my gynae got worried that the baby will get too big and it will be a difficult birthing for me. In the end, my baby was delivered well and at a weight of 3.6 kg. This episode got me interested in knowing more about the nutrition of durians. Apparently, durians, like bananas and avocados, is a high energy fruit. 100g of its flesh provides 147 calories. It is also rich in minerals such as potassium (regulates heart rate and blood pressure) and vitamins (vitamin C for resistance against infectious agents and B-complex vitamins for breaking down nutrients and provide new energy). So the next time you feel that you need to feel rejuvenated, take durians! 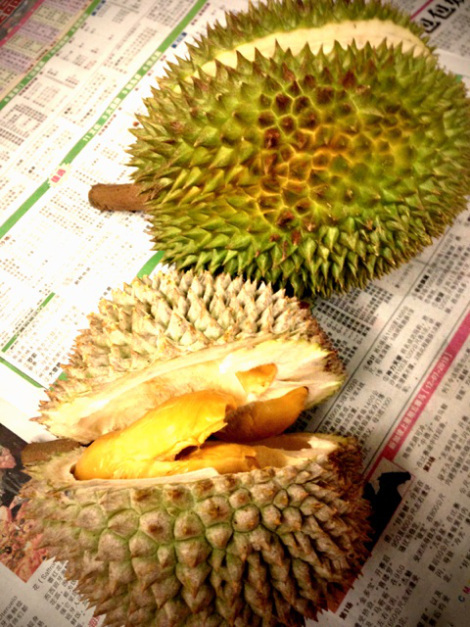 If you wish to know more about durians and where to get good ones from honest sellers in Singapore, check out Hungry Ang Moh’s blog post on durians. BGO Ecoshop (www.BGOecoshop.com) now stocks Green Cleaners cleaning products that meet all cleaning needs of every home! Green Cleaners’ products are respectful to the aquatic life, meet strict biodegradability standards and reduce packaging with their revolutionary concentrate concept. Why buy concentrate? SAVE, SAVE, SAVE! Green Cleaners’ ultra-concentrate formula will make more than 5 litres of diluted product. This means they can reduce their packaging, transportation footprint and plastic usage, whilst you save $$$$’s with cost effective cleaning solutions! Now there’s no need to ever have harmful cleaning products in your home again! Feel great and make the change. Get the Green Master Kit that comes with 6 concentrate cleaners + 6 dilution bottles for great convenience and savings! 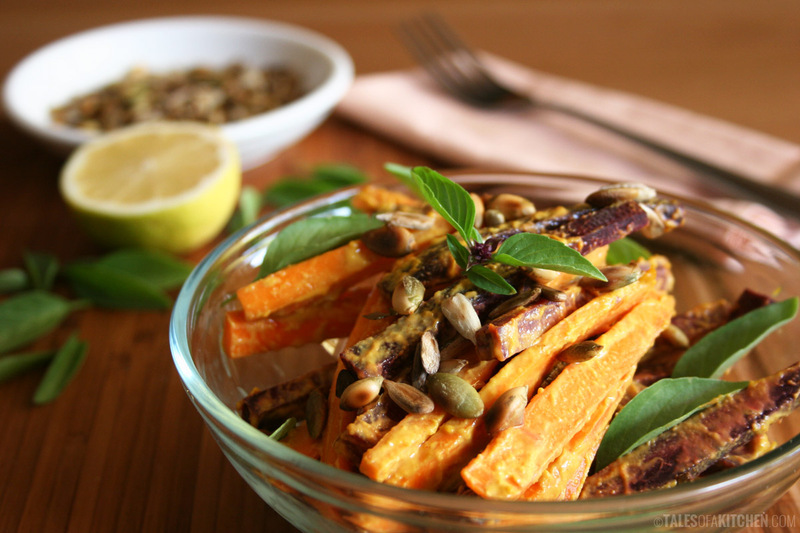 A simple salad by Chris Anca of Tales of a Kitchen made with sweet heirloom carrots, Thai basil, pumpkin and sunflower seeds and a creamy, spicy-sweet curry sauce. 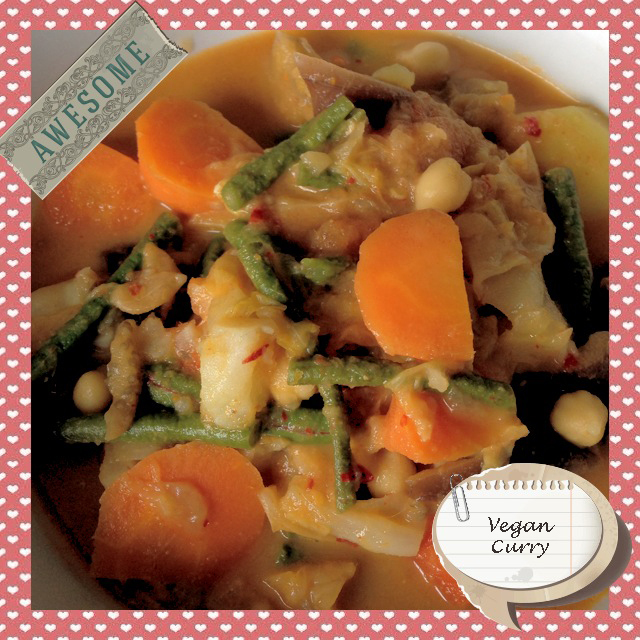 Note from BGO Ecoshop: You can add some curry powder to the salad for more flavour. 1) After cutting the carrots I mixed together all the ingredients for the dressing until completely incorporated. Added the dressing to the carrots, mixed by hand to coat and topped with the seeds and fresh Thai basil. 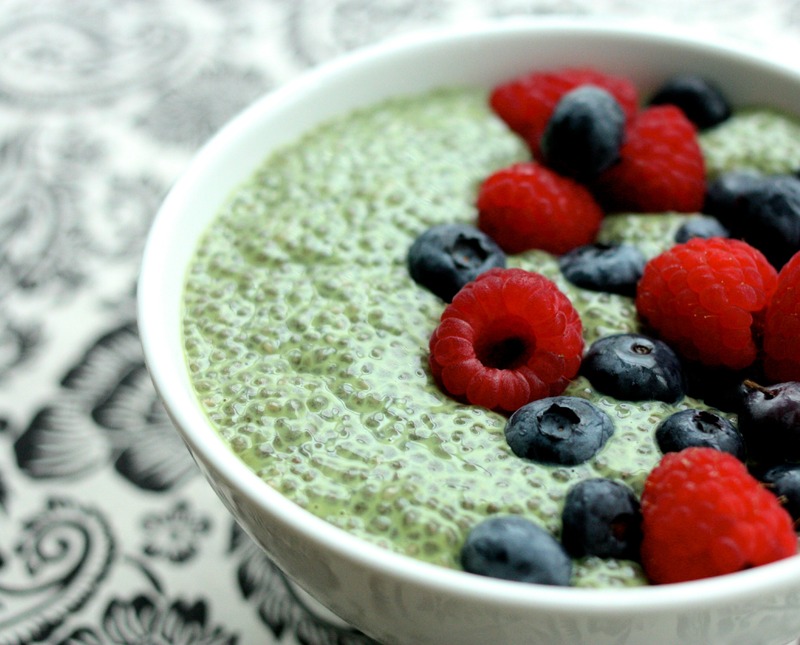 Matcha, or finely milled green tea powder, has a rather strong, grass-like flavor on its own but blends beautifully with a sweet, creamy nut milk in this chia pudding recipe by Gena Hemshaw. Gena recommends adding fresh berries to this pudding and enjoying it for breakfast. 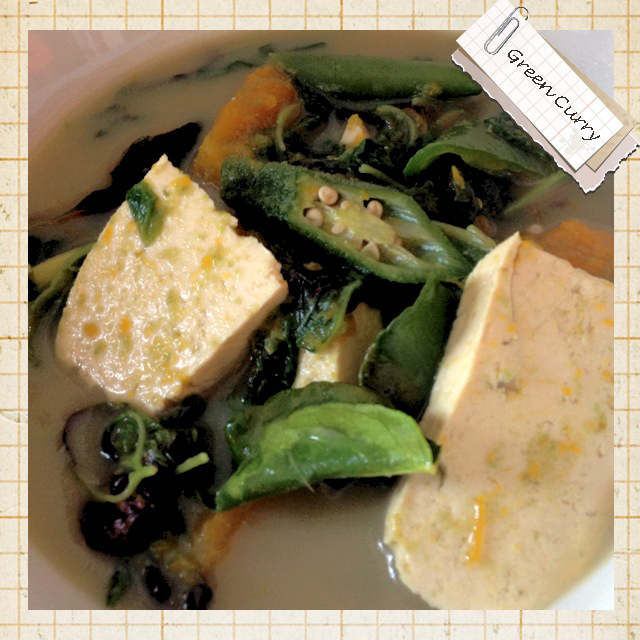 What an amazing way to get loads of antioxidants, calcium, protein, and essential fatty acids. 1) Blend the milk, sweetener, vanilla, and matcha together in a blender till smooth. 2) Pour the liquid over the chia seeds. Stir thoroughly. Stir again every few minutes for the next fifteen minutes. Then allow the mixture to sit for at least an hour (or overnight, in the fridge). 3) Stir the mixture once more, and serve with fresh berries. Makes 2 servings. 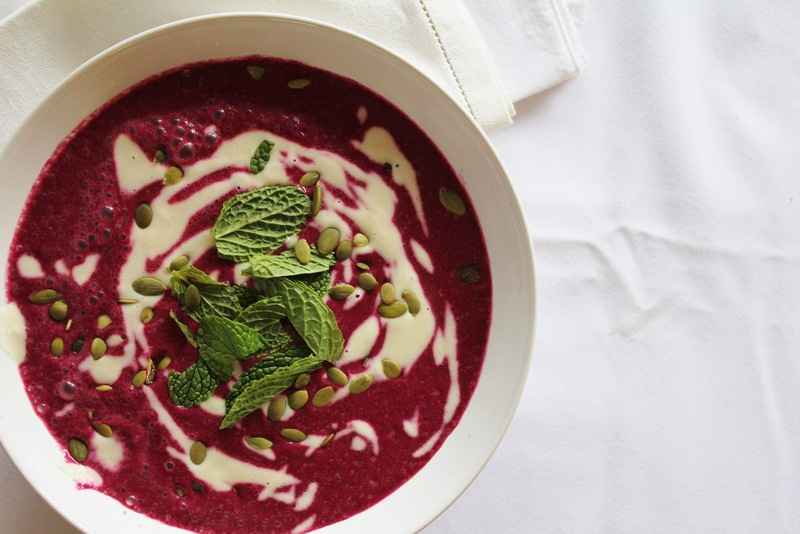 A densely pigmented soup made with a base of fresh beet root and avocado, seasoned with a hint of tamari, miso, fresh ginger, garlic and a dash of salt and pepper. Use hot water if you want something to warm the belly, or cold if you want a chilled soup. Top with cashew cream and a spinkling of pepitas! Note from BGO Ecoshop: You can replace the Cashew Cream with Dastony Stoneground Organic Cashew Butter for more convenience! 1) blend everything together in your Vitamix until very smooth. Taste and adapt to your liking. Place in bowls and set aside. 1) blend the cashews with the water, salt and cinnamon until creamy. Add a little more water if you don’t want it so thick. Change it as you like. Spoon onto your soup and enjoy! I recommend adding some fresh herbs and seeds. I used peppermint and pumpkin seeds but any combination would be lovely. BGO friends enjoy discounts when you sign up for NutriHub‘s classes! Contact Ms. Vinitha Ang (9236 8402) now for more details. 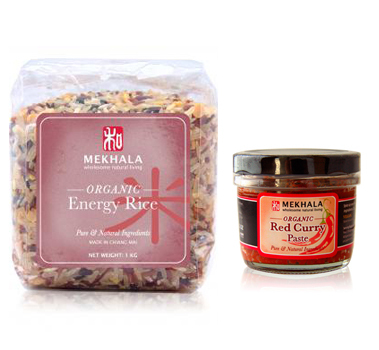 Superfood Sale now on at www.BGOecoshop.com (till 30 July 2013)! Superfoods sale now on at http://www.BGOecoshop.com! 15% off most items till 30 July 2013. Free 6oz. Rawmio Chocolate Halvah for purchases over $120. While stocks last. Bundle Deals will be suspended during this promotion period. What is the difference between the different coloured maca root powder? Maca (Lepidium meyenii) is a root vegetable grown high in the Peruvian Andes. It has been used as a food and medicine in South America for centuries. Well known for its ability to help enhance strength and endurance, it is said that the Incan warriors would consume maca before long journeys and even battles. Cream coloured roots are the most widely grown and are favored in Peru for their enhanced sweetness and size. Balance hormones for both men and women – this can support with menopause, acne, fertility, thyroid and other health problems related to the endocrine system. Black maca is considered the strongest in energy and stamina-promoting properties, being both sweet and slightly bitter in taste. In a study from 2009 at the a Peruvian University, Black Maca was seen to be the best of all varieties for increasing sperm production motility and volume as well as for increasing libido. In 2011, 2 different studies, one from China and one from Peru found that Black Colored Maca helped laboratory mice improve their memory and concentration skills. Red Maca (Lepidium meyenii or Lepidium peruvianum) is the rarest of all varieties of maca. It is sometimes called pink or purple maca, but is most generally referred to as “red maca.” Red maca is becoming popular with many people. It has a milder taste than cream coloured maca and has been clinically shown to reduce prostate size in rats. Red maca has been shown, under phytonutrient analysis, to be higher in certain compounds that support the body in antioxidant and anti-tumoral activity. It has also been shown among all macas to contain somewhat higher levels of other pythonutrients including alkaloids, tannins, saponis and steroids. Maca is an adaptogenic. An adaptogenic substance is one that demonstrates a nonspecific enhancement of the body’s ability to resist a stressor. Many herbs have exactly these properties. It is not recommended that you take two or more adaptogenic herbs together. Only take one adaptogenic herb at a time. Also avoid taking dong quai, black cohosh, licorice root and fertility drugs with maca. If you are taking any drugs, make sure you consult a health professional before taking maca. Start with a small amount, 1/4 tsp. in the morning. You can repeat the same at night, always taken with meals or just before eating. Do so for a week or two to notice any changes. Increase the dosage by another 1/4 tsp. if no changes have been noticed. Maca has an effect on the endocrine system which balances hormone. Some people will notice a difference quicker, while others may take slightly longer. You should not exceed three teaspoons a day and don’t take it all at once. The latest it should be taken is just before dinner, as it can affect sleep. Most importantly, give your body a maca break once a month. If you have been on maca for a month, take a weekend off. If you have been taking it for 3 months or longer, take a full week off. This is to keep your body responsive to the phytonutrients. I got invited to attend UBS Eco Fair on 14 June 2013. Sweng and I set up BGO Ecoshop booth there to introduce some Superfoods we were selling on our online store www.BGOecoshop.com. 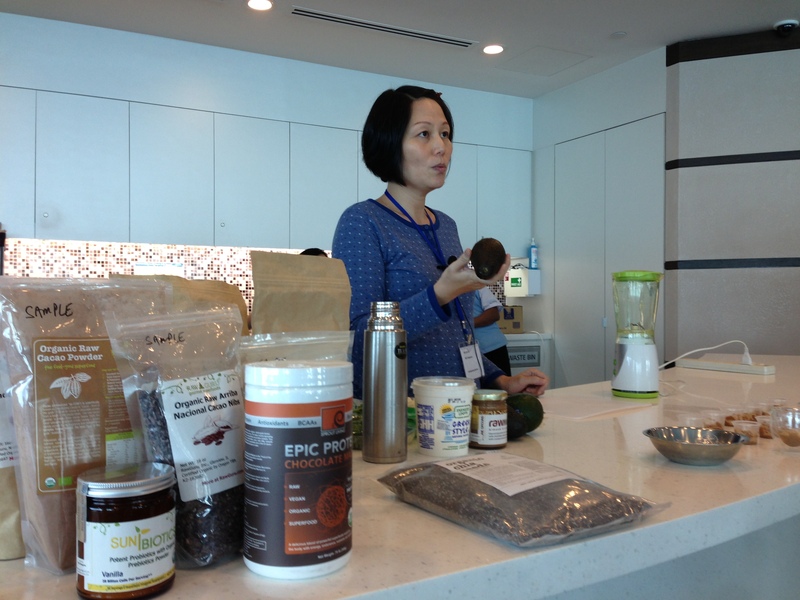 I also gave a demo on how to make heathy smoothie and I chose the two fruits that I often use – avocado and banana. 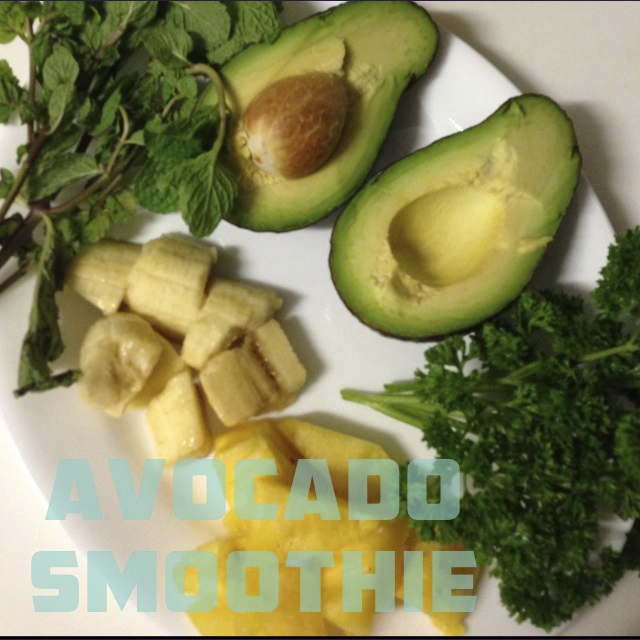 The following are the ingredients that I used for the smoothie workshop. Note that you can just use avocado and banana together with any liquid (any milk, water etc) that you prefer. The addition of herbs, nut butter and yoghurt are optional. Avocado is a great fruit and it is a pity that some people avoid it because of its high fat content. But the truth is that we need fats as a source of energy and support the function of our nerves and brain. The key is to substitute saturated fats and trans fats with nutrient dense fruits like avocado which offers mono and polyunsaturated fat content. Besides beneficial fats, avocado also gives us good amount of carotenoids, proteins and it is anti-inflammatory. This means avocadoes can help prevent or mitigate against both osteo- and rheumatoid arthritis. The information above is based on the USDA National Nutrient Database for Standard Reference. Search the database for “avocado”. I can’t tell you a fruit that is more commonly used in smoothies than bananas. It is such a versatile nutrient-packed fruit and is often used as baby’s first weaning food. Naturally fat- cholesterol- and sodium-free, bananas are also a good source of potassium (helps our heart beat, reduce heart disease), dietary fibre, magnesium (transmission of nerve impulse, aids absorption of calcium) and vitamins B6 (aids healthy nerve and brain functions) and C.
Normally, I would limit my smoothie to just two fruits. But I saw some pineapples idling in my fridge on the day I made the smoothie, so I added them as well, as they add a sweet tropical taste to my smoothie. Pineapples are loaded with vitamins and minerals including vitamin A, vitamin C, calcium, phosphorus, and potassium. It is also rich in fiber and calories. On top of it all, this fruit is low in fat and cholesterol. All the nutrients it contains promote good health. I opted for fresh coconut water (the clear type, not to be confused with coconut milk, which also has its health benefits, but that’s another future post.) Coconut water contains easily digested carbohydrate in the form of sugar and electrolytes. It has fewer calories, less sodium, and more potassium than a sports drink. If you are using milk instead of coconut water, I suggest using lactose-free milk such as oat milk (high protein and fibre content), quinoa milk (good amount of amino acids) and soy milk (high in essential fatty acids). These are more easily digestible than dairy milk and contain more health benefits. I included herbs like parsley because I wanted to zest up the smoothie which I knew would have a sweet taste. Parsley is often used as garnish but it turns out to be quite a good addition to smoothie as well. It is rich in many vital vitamins (Vitamin C, B 12, K and A) and keeps our immune system strong, tones our bones and heals the nervous system too. Regular use of parsley can help control your blood pressure. Pregnant mums will welcome the folic acid in this herb. I blended a small amount of mint leaves to give the smoothie a fresh minty aroma. Mint is a great appetizer, and it promotes digestion. It also soothes stomachs in cases of indigestion or inflammation. I added some yoghurt for added creaminess in the smoothie and also to introduce some healthy live cultures (probiotics) to our intestines. These aid in digestion as well as giving us calcium, vitamin B-2, B-12, potassium and magnesium. I filled the bottom of the smoothie cup with 2 teaspoons of Rawmio raw & vegan Almond Crunch (almond nut butter with added raw cacao nibs, raw coconut, sweetened with coconut sugar, flavoured with vanilla beans and Himalayan salt). I also smeared half the sides of the smoothie cup with the back of the spoon such that the chocolate almond nut butter is visible on the outside of the glass (looks nice and tempting!). I chose the crunch series of Rawmio’s nut butter, as it provides cacao nibs to munch on. 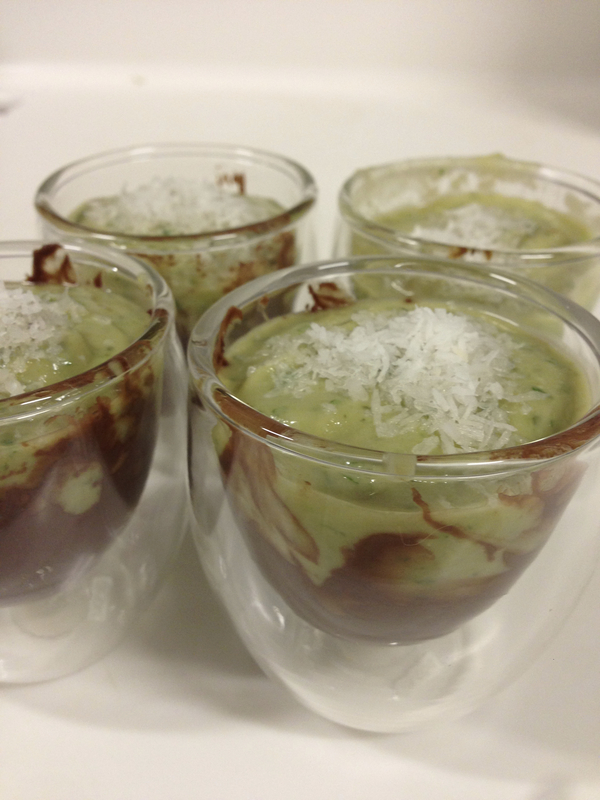 Also the chocolatey taste goes well with avocado and banana. You can add nuts to your smoothie to have the crunch too. Almonds are a good fiber source and also contain protein. Because of their high monounsaturated fat content, they are a healthy food choice. Almonds or almond butter provide us with vitamin E, potassium, magnesium, iron, calcium and phosphorus. You can opt for other nut butters, just make sure that they are processed in low heat and not added with unhealthy ingredients such as additives, excessive salt, sugar or saturated fats. Used as toppings on our smoothie. Coconut flakes give a distinct tropical flavour! You can swop for other toppings such as chocolate chips, cacao nibs or nuts. 2. Blend the fruits after adding some liquids (coconut water, milk or plain water). Add a little liquid (a few tablespoons) at a time. If the fruits seem to have a hard time churning, you need to add more liquid. 3. Tear the herbs into smaller bits and blend. Start with a tablespoonful of each and adjust amount according to your taste. 4. 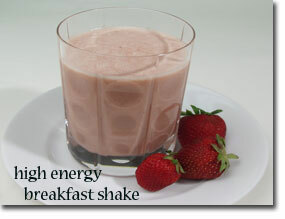 If you happen to add too much liquid and prefer your smoothie to be thicker and creamier, add a tablespoon of yoghurt. 5. Prepare your serving cups. Scoop 2 teaspoons of nut butter into each cup and smear half the cup with the back of the spoon. 7. Sprinkle the top of the smoothie with raw unsweetened coconut flakes for flavour. If you intend to chill your smoothie before serving, then add the nut butter only before serving, on top of the smoothie. Otherwise, the nut butter will harden at the bottom of the smoothie upon chilling. You can make your smoothie beforehand and freeze them in ice cubes. When you need to have them, just blend them with some liquid. 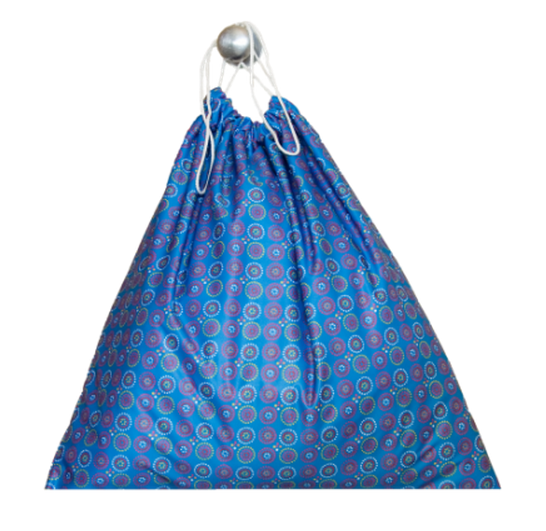 Bummis Swimmi Swim Diapers new designs – Koi Pond, Camping Critters and Bubbles now available at BGO Ecoshop! Bummis SWW New Designs now in! Bummis Super Whisper Wraps new designs – Rocket, Bloom, Big City, Lady Bug, are now available at BGO Ecoshop! I discovered quite a gem while looking up the nutrients of lentils* over the internet! The World’s Healthiest Foods site is started by The George Mateljan Foundation, a not-for-profit foundation. The site contains many useful articles & information, including recipes relating to health and food. What I like most is the over 100 quick and easy recipes they posted (cooking times of 30 minutes or less). 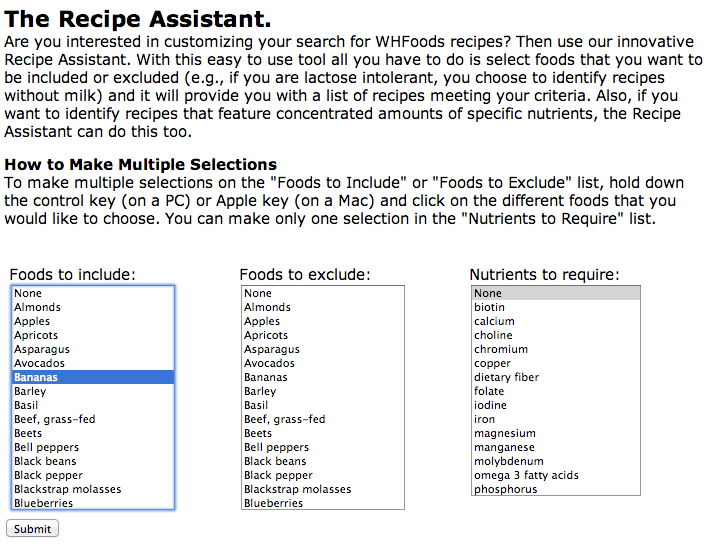 Not only are the recipes healthy, what makes it different from most recipe sites is that they have a Recipe Assistant where you can select multiple foods to include and/or exclude as well as nutrients required, and voila! The right recipe recommendation pops up for you! 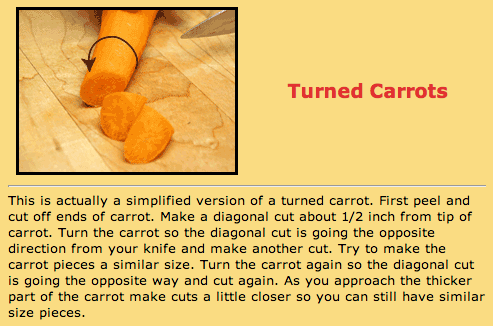 Also, what is sweet and really useful is when you are browsing a recipe, there will be highlighted ingredients that when you click on, it shows you additional information on that ingredients, like how to make broth, and how to cut and prepare tomatoes, carrots etc. Very useful! *Lentils are legumes that are great cholesterol-lowering fibre foods. They have beneficial effects on the digestive system and heart, and also help to stabilise bood sugar. They also provide iron for energy (good for children, adolescent, pregnant and lactating women). This embedded video is also mentioned in our previous blog post on why sprouting of nuts is good. This video illustrates the stone grinding process which ensures low heat and smooth butter texture. This is an embedded video mentioned in our previous blog post on how you can sprout your own nuts at home, dehydrate them and blend them into delicious nut butters. Do not be over-zelaous in your blending as high heat will destroy the enzymes and nutrients in the butters. We have often been asked what is the difference between the normal nut butter that we sell and the sprouted nut butter, which we also have. 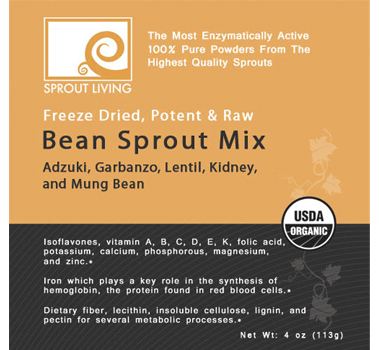 Well, I am sure most of us have had the experience of sprouting mung beans before. Sprouting of nuts really means about the same thing. The nuts are soaked for some time (usually 24 hours) causing them to begin to germinate, before they are slowly dried at low temperature. Low temperature food processing of not more than 40-46 degrees celsius is considered ideal (hence what we call “raw food”) as high heat will kill the enzymes and nutrition that is beneficial to us. Though more time-consuming, sprouting makes nuts more digestible, as the process destroys the enzyme inhibitors, allowing the body’s natural enzymes to digest the nuts more easily. 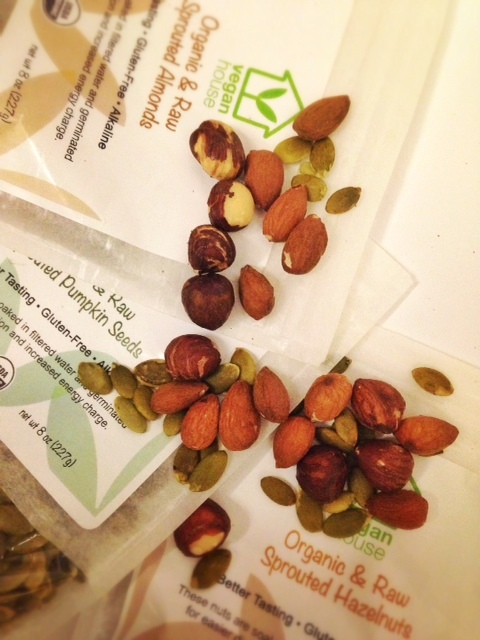 Sprouting and slow dehydration also releases the full nutritional content of the nuts and makes the nuts crunchier. Also, because of the digestibility of sprouted nuts, these nuts are suitable for people with nut allergies. I have found a video that illustrates how you can make your own raw sprouted almond butter at home. You will need a good blender, a dehydrator and above all, patience and a good deal of time. In the video above, you will notice that the resulting nut butter is not exactly smooth. Rawmio & Dastony stone ground raw nut butters achieved their lusciously smooth texture by grinding them in stone grinders, which ensures not only a silky smooth texture, but also that the grinding process does not get too heated such that nutrients and enzymes are lost. Here’s another video showing how you can stone grind your nuts (best sprouted beforehand) at home using a stone grinder. Again, you will need some patience and time, but you can get raw stone ground nut butters adjusted to your own palate. If you don’t wish to get a dehydrator and a stone grinder and spend the time, but still want to get to savour raw organic vegan stone ground nut butters, you can purchase them straight from our store www.BGOecoshop.com. 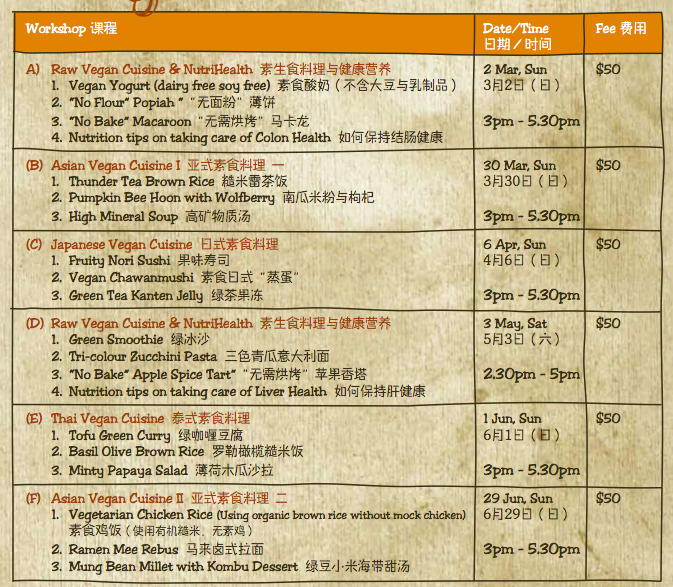 Singapore’s first Vegan Culinary Certification Program brought to us by The Veg School! The Investment for Culinary Certification Program is SGD 1800 net per pax. ~ Students are to attend 80% of the 15 sessions, in order to be awarded a certificate by TVS. 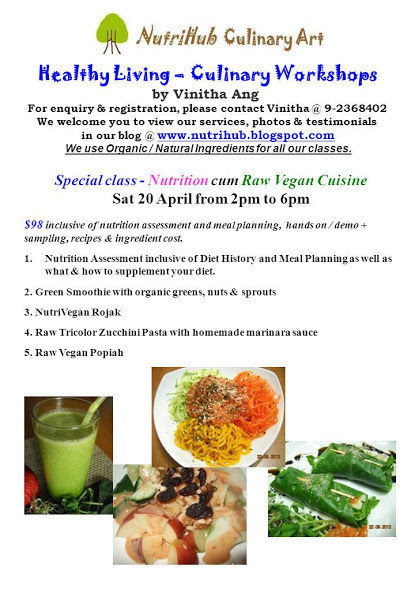 Ms. Vinitha Ang has announced her April Sat afternoon schedule for her raw vegan cuisine classes. A cookery studio for the culinary enthusiast! Located at 30A Smith Street Singapore 058944, Chef Cookery Studio is a culinary learning place where one can learn practical tips from experienced professional chefs. 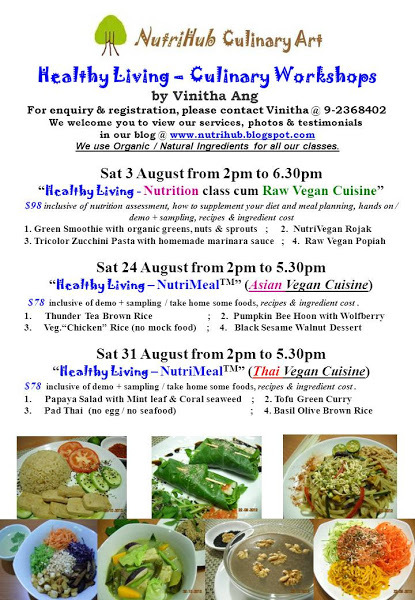 In fact, you can find out one of our favourite raw vegan cuisine teachers, Ms. Vinitha Ang having her classes there. Ms. Vinitha Ang is trained in nutrition & psychology with a master degree in heath care management. A vegetarian herself, she formerly owned NutriHub – the Organic Fusion Café and founded Nutrihub Culinary Art in June 2012. 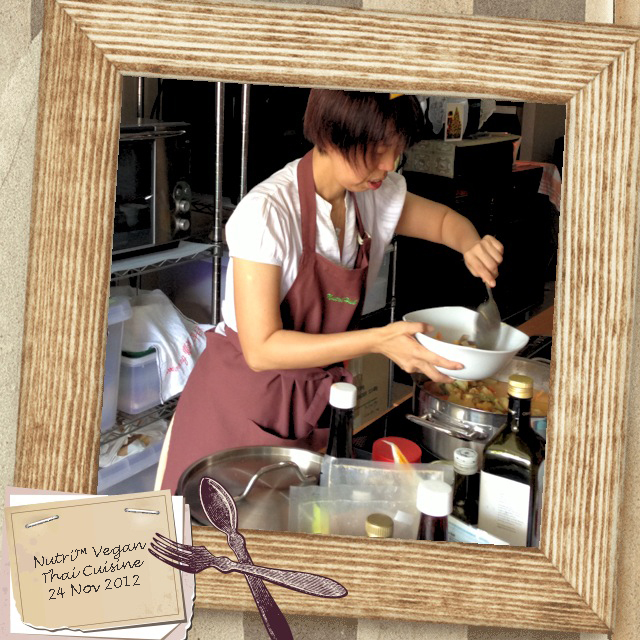 Since then, Ms. Vinitha Ang has conducted various classes such as vegan baking, vegan Thai, Vegan Japanese and vegan Asian cuisines. 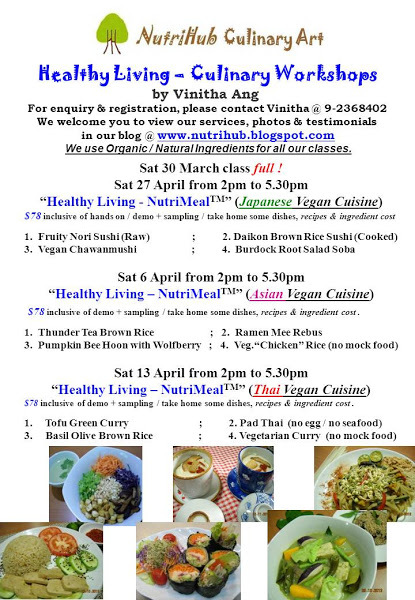 See NutriMeal cooking class 18 April 2013 or visit Chuyi Studio Schedule for Ms. Ang’s weekday class schedule. Lusciously smooth Rawmio & Dastony stone ground nut & seed butters re-stocked! Get Bundle Deals for the above for more savings! CREATE YOUR OWN BUNDLE DEAL! Can’t see a bundle deal that you want? Choose a combination of Dastony, Rawmio, Rawguru or Sunbiotics super foods that meets a minimum of S$80 in total*, and we will apply a 20% discount on your total! Email us at bgosingapore@gmail.com with your order details. Payment by interbank transfer or credit card / Paypal. *Individual items only, Bundle Deals combo not applicable. For orders more than S$250, please email us for wholesale enquiries. Gluten-free, nut-free, soy-free, wheat-free, fat-free, no preservatives, non-GMO. These nutrient dense sprout mix are easy to use – simply add to smoothies, soups or stews, even salads. 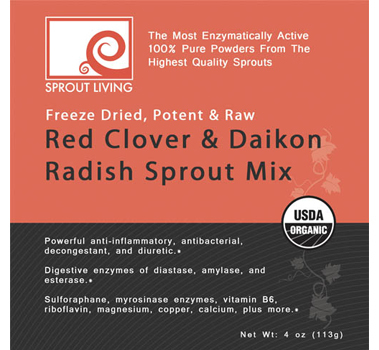 Broccoli & Kale, Bean Sprout Mix, Red Clover & Daikon Radish Sprout Mix. 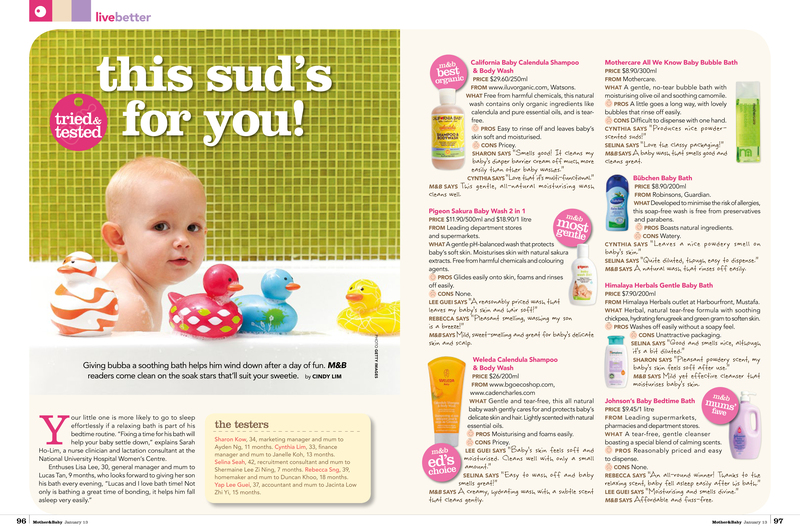 Our Weleda’s Calendula Shampoo & Body Wash was voted Ed’s Choice in the Jan issue of Mother & Baby magazine! Weleda’s Calendula Shampoo & Body Wash is available at BGO Ecoshop here. CNY is just round the corner. If you have been looking towards learning to bake yummy cookies or even to make Yu Sheng, why not learn to make healthy raw food version?! 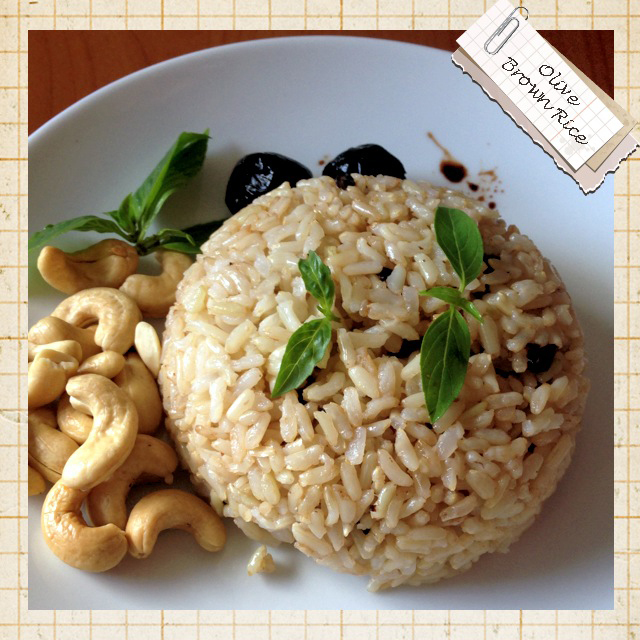 Nutrihub announced their Jan 2013 Culinary Art Workshop. Remember, BGO friends get to enjoy 15% discount – just mention Chewy or BGO Ecoshop. 10% discount for anyone who registered for 1 class. 12% discount for those who registered for 2 classes or with friends. 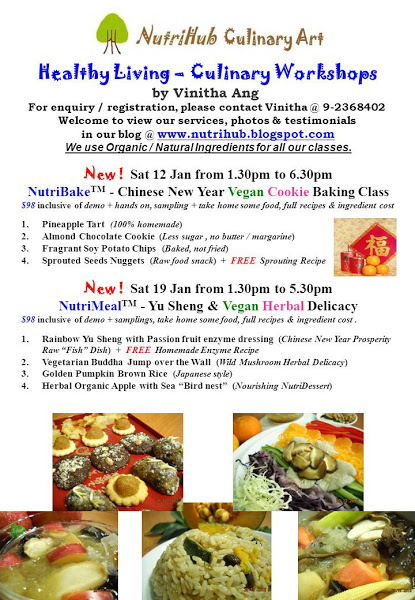 12% discount for NutriHub student who registered for 1 class. 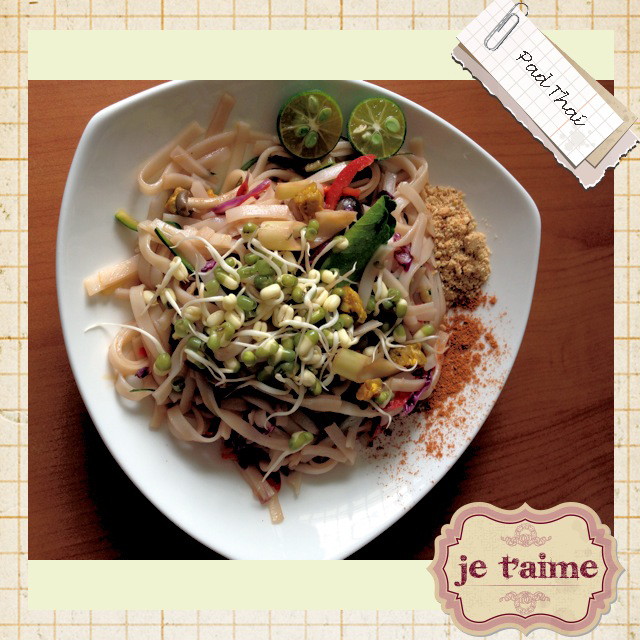 15% discount for NutriHub student who registered for 2 classes or with friends. $98 (before discount) inclusive of demo + hands on, sampling + take home some, full recipes & ingredient cost .